United Aircraft Corporation will participate in the LIMA-2019 international exhibition. 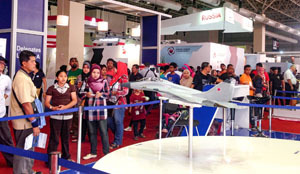 This event is a key exhibition in the Asia-Pacific region of military equipment and dual-purpose military products, which has been held with support of the Ministry of Defense of Malaysia since 1991 on the Langkawi island. Russia is a traditional exhibitor at LIMA, with the main purpose to present national military-technical potential to the Southeast Asia market and the Asia-Pacific region at a whole. The united exposition of UAC and its subdivisions will occupy 175 sq. m in the pavilion A (Stand A262). The visitors will be able to get familiar and receive information about the T-50, Su-35, Su-32, MiG-35, Su-30SME, Yak-130, Yak-152 , Be-200, Be-103 and MC-21 aircraft.